The craft beer industry is re-shaping commercial design — and with it comes a serious need for industrial lighting. Here’s a few ideas that will put any craft room in a good light. Old space in a new light. The best part about breweries is that they breathe new life in old spaces like warehouses and factories where many call home. These types of spaces pair perfectly with vintage lighting. Brick, exposed wood ceilings and vent systems look great with truly any type of lighting that has a more rustic or industrial vibe. Check out our project, The Finch Kitchen, for example. This Chicago-based brewpub's exposed timber beams and reclaimed wood walls give way to its rustic and industrial vibe that worked great with our pendant lighting fixtures. The pendant lights also reflect a bit off the space’s venting system, creating more light in a room with plenty of awesome dark wood. Pendants for the win. With the exposed beams and ceilings found in many breweries, pendant lights are a great way for lighting to “slip through the cracks” so to speak. You can more hang them more accurately over bars, tables or entries than other types of overhead lighting like track lighting that requires a finished ceiling. Plus, because some of the older warehouse-type spaces can easily have 10,000+ square feet, pendants provide sufficient light in a big space without giving off the alien-like, cold glow of some overhead fixtures. We love this idea from Forbes Magazine — the pendants hang through the exposed beams, directly over a wooden bar to create moody, ambient lighting. For the same effect in your space, check out our Porcelain Panther pendant. They come in multiple colors and are based off of similar 1950s Czech warehouse pendants. Make it moody. 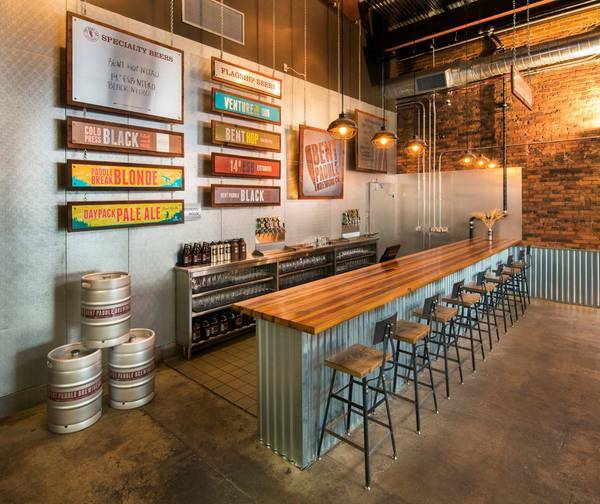 While we think the “alien-like glow” of some overhead lights should be avoided in any space (maybe with the exception of an operating room), breweries more so than most commercial spaces benefit from darker, more moody lighting. Drinking beer in a taproom has become an immersive experience, and lighting for that experience makes all the difference. We suggest opting for warmer bulbs in our pendants for brewery spaces — it not only looks better with the wood, brick and metals commonly found in brewery design, it actually makes the beer look better too! While too warm light can tend to be a bit soporific, and make it harder to focus on specific tasks (hence cooler lighting in office spaces), we’re drinking beer here, so get warm lighting, hunker down and tap another cold one. Bent Paddle Brewing, Superior, MN.